Starting with our Signature 5 Question Interviews with several Filmmakers screening during #PAAFF18. 1. T&T: In a nutshell what was the main inspiration for your film? Evelyn Obamos: Our film is centered around Bay Area-based Pinay rapper Ruby Ibarra's production process for her music video, Us. I've always been a fan of her music, so when I was put in touch with her for this project I was already super elated. I'll never forget when she said, "Women are often pit against each other, and here we have 200 pinays gathered to shoot this music video." It was a monumental moment, that continues to evolve as a movement. Of course I had to shoot this! 2.T&T: Was there a point where you almost didn't finish your film? And if so, what pushed you forward? Evelyn: Ruby shot the music video in partnership with Burgundy Suites, and their target production date was International Women's Day in March. By February, a cast of over 150+ pinays were already sourced via social media on Ruby's twitter, facebook, and instagram handles. But we didn't have a venue. In fact, it wasn't until two days before the shoot that we finally confirmed all the shoot details, including costumes, a vintage car, and dancers. Like many things in our Filipino community, it took a village and all the music video footage was shot within two days. 3. T&T: Give a quick shout out to your creative team and anyone who helped get your film from an idea to screening at PAAFF18. Evelyn: This video was made possible through a whole community effort. Shout outs to NPhared for the track music; Beatrock Music for producing the whole Circa 91 album; Dale Keano and Gordon Lim of Burgundy Suite; Freedom and Ate Allyson for hooking us up with a whole high school (Balboa High School) as our stage/playground; Volunteers from Pin@y Educational Partnership for helping the shoot dates flow smoothly; and all the pinays that were part of the video shoot! By now the music video is streaming all around the world and that effort was amplified through The Filipino Channel (s/o to Ginger and Bev), and then our documentary was invited to world premier at the Center for Asian American Media Film Festival in May. Our screening sold out and catapulted us into how we're on a film fest tour – Toronto, Boston, Guam, Atlanta, Paris, NYC to name a few. 4. T&T: This year's theme is music, tell us a bit about the music of your film? Or does food play a big part in your film? Or answer both. Evelyn: Us is a call to action, for all women, brown women, our sisters. You don't have to be Filipino to relate to the track, because it draws from global tropes of resistance and solidarity. What you see in the documentary short are women who are multi-dimensional and unapologetic. 5. T&T: What does it mean to you to screen your film at the 11th Annual Philadelphia Asian American Film Festival ? Evelyn: Screening at PAAFF means amplifying our message, beating the drum even louder, and reaching more folks to talk about representation of Pinays on the big screen. Revolution Selfe expands the horizons of documentarystorytelling while broadening our understanding about the lesser-known fronts in the global “War on Terror.” Filmmaker Steven De Castro paints a portrait of a 48 year-old Maoist guerilla army in the Philippine hinterlands known as the New People's Army. But rather than simply presenting interviews and images in a traditional journalistic manner, this flm weaves fantasy elements and web-based camera techniques into the documentary form to disrupt our entire matrix of widely held beliefs underpinning the discussion of terrorism, poverty, and the motivations of the warriors who fght in a peasant revolution. Steven de Castro: Throughout our lives, Filipinos like myself have always heard about this armed guerilla group called the NPA or New People's Army, and sometimes they would be looked at as heroes against a corrupt government, and sometimes they would be portrayed as terrorists. So it started as a curiosity that turned into a passion. I decided to see for myself, not just by meeting with them, but living with them for a couple of months. Steven: In a war there is always the possibility that you won't finish your film, because obviously you might not make it back. But it turned out that the greatest risk to the film, and to life and limb, was riding on the backs of motorcycles as they were flying down muddy mountain roads at high speed. Steven: My wife Rose was a great help to me as always, but also to the warriors of the Pulang Bagani Battalion who were incredibly hospitable and some of whom even risked their lives bringing me into the combat zone to allow me to make this movie. 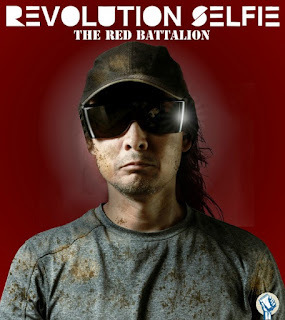 Steven: The music of Revolution Selfie was made by the activists who are part of the liberation movement in the Philippines, and it includes the music of Danny Fabella, a Philippine folks singer who is the hopeful voice of his generation. We also have a cameo by Nejma Nefertiti, an incredible revolutionary hip hop emcee from New York City, one of the greatest women in hip hop today. Steven: HUGE. 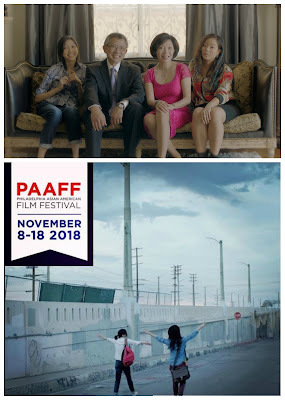 I love screening at PAAFF because they demonstrate the most creativity of any of the film festivals of the Asian American circuit, and they are the best organized. They do the best job of any festival in matching each program with the right audience, and that is very important for a film like Revolution Selfie, which is an avant garde documentary/fantasy film that has to find the right audience. An ancient monster emerges from the “Old Faithful” geyser at Yellowstone, attacking an artist doing a residency and wreaking havoc in Jackson Hole. Shot from miniature hand-made paper and cardboard models and sets combined with video sequences, the monster, Satyrius Marinus, from a seventeenth century engraving, comes back to life and bursts from an “Old Faithful” calendar image, surprising a tour bus full of Asian tourists among others. 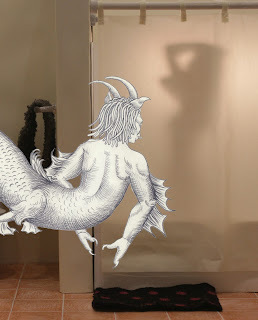 An innocent artist is accosted while taking a shower by this terrifying beast with a wicked sense of humor, as Donald Trump`s victory speech plays on her laptop. Yeon Jin Kim: One day I was taking a shower at home and the bathroom door popped open by itself, which scared the heck out of me. The door opened because the apartment is very old and nothing works well, but it caused me to imagine being attacked in the bathroom and eaten by a monster. A short time later I was invited to do a residency at the Teton Artlab in Jackson Hole, Wyoming. I decided to use this opportunity to develop this experience into a monster movie using the environment of Jackson Hole and the landscapes of Yellowstone National Park. I was also influenced by a Korean folk tale about a nine-tailed fox who wanted to become a person. In order to become a human, she needed to seduce one hundred men and eat their livers. She was successful with ninety nine but failed with the last man. It occured to me that this tale is reflective of the situation of people trying to assimilate into a society from which they are excluded. I was also influenced by the election of Donald Trump to the American presidency which was happening at that time. Yeon Jin:I had wonderful help from a few professionals but 80% of the production and post-production was done by myself. It is always challenging to build the energy to start a film and to maintain it to finish the project. My artist friends always help me with my projects. Yeon Jin: Eunsun Choi, my friend and motion graphic designer was extremely helpful. She did most of the morphing and taught me a lot of special effect skills. Minah Kim, who is a graphic designer was also very capable and helpful. These two artists were also great advisers and consultants. They always came up with great answers to my questions and doubts. Carlos Lopez and Joel Carreiro, who did the voice-over, added real comedy to the film. Quentin Chiappetta, a wonderful sound engineer, designed the sound which added more excitement to the film. Yeon Jin: The music at the end was Mark Twang and The Nervous Fellows, suggested by Quentin and perfect for the film. Yeon Jin: I was trained as a sculptor and interdisciplinary artist, not as a filmmaker. I have always been interested in making stories and sharing with an audience. I have found the film community very open to my work. The opportunity to participate in Film Festivals like PAAFF provides me an audience for my work, inclusion in a creative community and encouragement to continue with my projects. Living in the Story documents thirty-five years of art making by the distinguished photographic artist Patrick Ryoichi Nagatani, one of the most brilliant photographic artists of our era. In the late 1970s, he pioneered the Contemporary Constructed Photographic Movement in Los Angeles, developing a new visual vocabulary by constructing tableau photographs from sets, sculptures, models, and paintings. The film portrays an artist deeply concerned and well informed about world events who uses imagery, storytelling and narrative fiction to raise awareness about modern anxieties, with an emphasis on the threat of nuclear weapons technology. Nagatani has also explored healing techniques and states of consciousness in which the material world is transcended. Despite the serious content of his subject matter, his innovative images are compelling and entertaining. An engaging raconteur and teacher, Nagatani talks in the film about his projects, his unorthodox photographic techniques, and his subtle weaving together of fiction and fact. Scott Nagatani’s hauntingly beautiful music score provides the film’s soundtrack. Lynn Estomin: Patrick. Nangatani, the subject of the film was my main inspiration. Over twenty years ago, I had the privilege of meeting and becoming friends with him, a truly exceptional artist, activist and storyteller. Patrick was an amazing mentor to me. His enthusiasm for life and photography and his innovative approach to combining storytelling, history, politics, identity, community and multiple mediums into seamless images greatly influenced my own approach to creating art on political and cultural issues. Lynn: I was honored and humbled to be invited to collaborate on a film about Patrick Nagatani's life and work. I say collaborate because film making is always a collaborative process; but also, because Patrick was very much a partner in shaping this film. In a perfect world, I would have interviewed Patrick telling his stories as he created his fantastical sets and built his intricate models, but by the time I joined this project, he was too ill (stage four cancer with over 70 chemo treatments) to work in the studio anymore. So, the film is constructed primarily from archival footage I was able to locate, his artwork and over 20 hours of interviews from the Andrew Smith Gallery’s Legacy Project. The interviews were not done with a broad audience in mind, so this was a big challenge, as was the fact that I was racing the clock so Patrick could be involved in the editorial decisions and see the final cut. Plus, the diversity of his projects made it difficult to devlop a cohesive script. Finding a way to tie the work together cinematically and conceptually was challenging. What pushed me forward was an intense desire to introduce this innovative artist to a broad audience and to let him tell future viewers of his work what he was trying to achieve. Lynn: Scott Nagatani’s music score magically captures the nuances and diversity of his brother’s prolific work. Because Scott interacted closely with Patrick at each stage of his 30+ year career, as he was creating each of his varied series of innovative photographic work, Scott had an inside track to Patrick’s creative process, and that intimacy is reflected in the haunting and beautiful soundtrack Scott created as his final tribute to an older brother he loved and admired artistically. Patrick Nagatani often used food as a vehicle for humor and irony in his elaborate photographic tableaus. For instance, in on one image he has his extended family of Japanese Americans (whose parents and grandparents were interned during WWII) at a picnic at a atom bomb testing site, wearing kimonos and eating sushi with chopsticks, while an atomic blast reflects in their sunglasses. 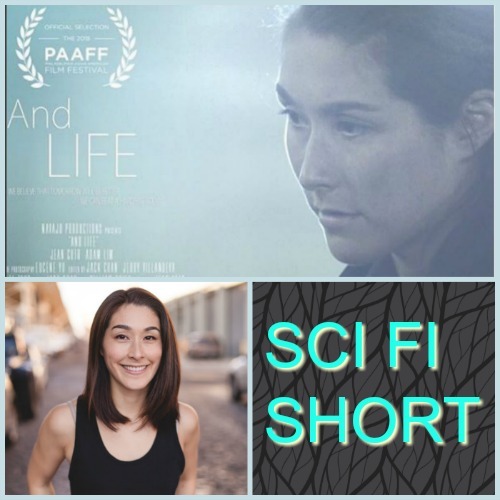 Lynn: It is a great honor to have my film chosen to screen at PAAFF. Patrick and his brothers were activists involved in getting permanent markers installed at the Japanese Internment camps to honor those who were detained and as a warning and history lesson for future generations. I believe screening this film now – when anti-immigrant sentiments are high and history could repeat itself – is important. A Pakistani transgender woman sets out to take care of an abandoned child. Hammad Rizvi: I wanted to give a voice to the unrepresented segments of South Asian society. When I saw transgender women and orphan children begging at Karachi's traffic lights, it was a connection I wanted to explore further. Hammad: Filming on location in Karachi can be very challenging on all fronts, and there were a couple scenes that many felt would be impossible to complete. However the entire cast and crew believed in the film's message, and that got us through the toughest shoots. Hammad: Everyone who was patient to read all my drafts! The film couldn't be made without the team at Grayscale in Karachi, and my supportive family. And of course Kami Sid - she brought Rani to life. Hammad: The music in this film is very unique. I worked with the super talented Rameez Anwar who created a soundtrack based on the South Asian instrument called sarangi. The instrument is able to lift your heart up or down depending on how its played, and that is exactly what I wanted for this film. The soundtrack is now available online, do check it out! Hammad: Super excited! It's so great to have stellar film festivals focused on stories from that part of the world, something that has changed drastically from when I was growing up. A warm, heartfelt film about blending families, featuring powerhouse performances from its all-Asian cast. Beloved late actress Elizabeth Sung plays Anna, a successful business-woman and single mother struggling with a strained relationship with her 20-something queer daughter Dede (Michelle Ang). Her widower neighbor Peter (Jim Lau) is the caretaker of his millennial daughter Laura (Jennifer Soo) who is on the Autism spectrum. When Laura and Dede form an unlikely friendship they each bond with the other’s parent, ultimately bringing Peter and Anna together to find an unexpected later-in-life romance. Alex Chu: The idea for the film all started over a bowl of ramen with actor Jennifer Soo, who was in a previous feature film I directed called "YES, AND..." We wanted to work together again, as well as veteran actors Jim Lau and Elizabeth Sung, both of whom I had worked with on my prior film as well. For me, rarely does a story idea come together in a singular moment. It's usually a cumulative thing that happens over time. I'm constantly jotting down notes - snippets of ideas, scenes, and characters that come from my own life and what I observe; the stories usually then come from assembling them into a more cohesive whole. The script for the film eventually came together in that organic of a way - through a combination of aspects of my own life that are deeply personal (addiction and depression run in my family), as well as the more practical aspects of having the actors over at my place to read through the script to get a feel for the characters. In terms of combining elements of documentary, animation and other mixed media, that was also an outgrowth and discovery of the characters themselves (i.e. since the main character is a photographer, it would open up the story by incorporating documentary elements into the structure to make the film feel like it's a super personal story from the main character's perspective). Alex: Going into production, we had no idea whether we could finish it - we only had the funds for production, and were hoping we could raise enough through a crowdfunding campaign to fund our post-production costs. For myself and the rest of the cast and crew, this wasn't the first indie/low budget feature film we've ever worked on, so while we were anxious, we had the prior experience to know what was in our control (do great work) and what wasn't. If you believe in the story and the people you work with, you just commit to it and hope for the best. As a director, one thing I've learned from prior projects and working with other directors as an actor is that especially on features and long-form projects, it's a marathon. You'll have good days and bad days, and it's essential to keep a level head - don't let the good days get to your head, but know how to recover from bad days. It's really about focusing on what you need to do right in the moment, what's ahead of you, and listening to others in a way that's productive to getting things done, rather getting distracted by your inner pundit, speculation or what could've, should've, would've etc that's already in the past. It's just about finding a way to power through it. Alex: We want to thank all of our Indiegogo supporters - without you, this film wouldn't have been possible! Animation director Natalya Serebrennikova's work speaks for itself - stunning. Irvin Liu our cinematographer and Ester Song Kim our production designer - both of whom brought a strong story sensibility to their work , as well as Peter Roberts our editor, whose expertise put all of us at ease by finding a way to make all these different media formats fit together seamlessly. We were lucky because all the way down the line, including our colorist Jon Fordham and sound mixer Michael Huang - all have a strong story sensibility that they brought to the technical side of their work. Our production team including Mike Gray, Tash Ann, and Patricia Ramirez who made miracles happen out of nothing - and at times having to be the bad cop to do so! In addition, the actors Jenny Soo and Michelle Ang came on as producers from the very beginning, and their input has been essential throughout in ways that made this film so special. And of course other members of the cast Elizabeth Sung and Jim Lau, in many ways, they helped with the story, having patiently gone through so many read through of early scripts, and constantly challenging the writer. On a last note, this film is dedicated in memory of Elizabeth Sung, who passed away earlier this year. She was a pioneer - one of the few Asian-American actors who paved the way over the decades for many of us filmmakers and actors working today. She was an actor on both features I've directed, and her work in FOR IZZY stands out as amongst her best in her 30+ year career. She had a big hand in the creative process of FOR IZZY, and this film in many ways is "for Liz". I miss you so much Elizabeth. Alex: With FOR IZZY in particular, the music acted more as a layer underneath the film that isn't immediately obvious - it's there to give more color to a scene, without drawing attention to it, almost as if it is part of the sound design (with a few exceptions). Music can be a tricky thing in film because it can either overpower or upstage the story when it should be complementing it (that is, unless the purpose of the story is the music itself), or as a crutch. Music should amplify, diminish, or juxtapose the moments in a story, and in FOR IZZY it's purposely subtle that at times blends in with the sound design. As a musician by background, I try to be very deliberate about how music is used. Alex: I'm a Penn alum, and so it's a homecoming of sorts, since I haven't been back in Philly since I was at Penn many years ago. From a personal standpoint, it's special because I was such a different person back then (or at least I think so! ), and coming back to Philly to screen a film, something that wasn't even in my realm of imagination when I was a business student at Penn, will likely be a bit surreal. I can't wait! Set in the near future when climate change has taken its irreversible toll on Earth, a dying man and his partner contemplate their past. Jean Goto: A few months before I wrote AndLife my grandmother died. I was struck by how she seemed ready to die and at peace with it through the last few weeks of her life and how that helped me process it all. So death was on my mind. But then so was climate change- it's become my mission to change the conversation around climate change and this film was a big step in that direction for me. At that time I was thinking about how all the things we take for granted now very well might not be a reality for the next generation. So these two ideas morphed into this film. Jean: It's very difficult to edit a film with a low budget- especially when you're the writer and director and actor! You just can't see the story clearly at some point. So there came a time when Adam Lim and I felt like hanging up our hats and calling it a day. Luckily that was when Patrick Chen came in as producer and breathed new life into the film - his clearer eyes and encouragement helped refresh the story structure into a more precise narrative. It was so cool to see the film through his eyes and to be re-inspired again! Jean: Food plays a part in the film in the lack of it. When I was imagining the world it was one where the leads could remember things like big meals around the table with family, or eating so much that you get sick. But it was the contrast in the film that's important; that now these characters had to fight for everything, including food. In terms of music, we were so lucky to get Li Zong on board. We heard his music online and there was something so eerie, but natural it. It seemed to fit perfectly with our film- there was almost a Japanese horror element that we really liked and then it was so great that Li was supportive when we approached him. Jean: It's just so cool to have a festival open to screening a dark sci-fi short about climate change! It's a hard topic, but one that really needs to be talked about and one I feel very passionately about. I'm especially excited because this is my first film festival as a writer director and as a woman of color I'm so grateful for my voice to be included in this line up of great artists! Representation is more important than ever so I'm just super excited and grateful that the Philly Asian American Film Festival has opened their arms to this short film! The image of the American hero is challenged in this heartfelt portrait of 9/11 Pentagon first-responder Isaac Ho’opi’i as he works to put that traumatic experience behind him with the support of his family and his love of Hawaiian music. Stephen Tringali: Our friendship with Isaac and the stories we’ve heard about him were the main inspirations. Maria and I were eager to make a film of our own. We had been working as parts of the moviemaking machine in Los Angeles, but we wanted to put our stamp on something. Maria’s mom said offhandedly, “You just need to make a movie about Isaac.” She made it sound so simple, but she was right. Isaac is easily the most interesting person we know, so why not make a film about him? Stephen: I don’t think there was ever a moment where we thought Corridor Four wouldn’t be finished. Most of the fears and doubts came from whether we could sustain a feature-length runtime. But we have Isaac to thank for bringing in his co-workers’ stories and leading us to the mental health aspects of the film. That became so important to understanding the internal conflict of all the officers involved. Stephen: There are so many people to thank on this film. Our families first of all: we stayed with them while filming in Washington, DC; and they fed the whole crew. Our editor Brad Allgood, who has cut some incredible films including Landfill Harmonic. He really helped put the film on the right track when we first started cutting. Our composer, Rob Rusli, who’s been a friend and collaborator since high school. Matt Radecki and Greg Lanesey at Different By Design, the post house where we colored the film with Kevin Canon. They’re pillars of the documentary community in Los Angeles, and we were so fortunate to have their support. And of course, the programmers at Washington West Film Festival (Brad Russell and Ariel Lee) and Hawaii International Film Festival (Anderson Le and Anna Page). They’ve been wonderful champions of the film, and we have them to thank for our film’s festival life. Stephen: Music is an incredibly important part of the film because it’s the key to Isaac’s recovery process. At the end of the film, Isaac plays this wonderful song by Jerry Santos called “Ku'u Home o Kahalu'u”. The moment signals a turning point for Isaac. His family loves that song, and because it meant so much to them, we wanted to include this moment in the film. So, Isaac actually introduced us to Jerry when we were filming in Hawaii, and he was thrilled to allow us use of the song. Stephen: I’m so grateful to have a film screening at PAAFF because I’m a Pennsylvania-native. I was born in Pittsburgh, PA and grew up in Hershey, PA. Now that I live in Los Angeles, I can’t even begin to explain how much I miss Pennsylvania. All the sensory details that come with the state are tied to my memories of childhood, and I truly enjoy every chance I get to visit. That I get to share this film with my native state is incredibly satisfying. After losing her boyfriend to depression, a computer scientist creates and anti-depression AI application and looks for funding to complete it. 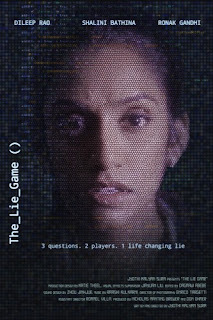 Following a string of failed interviews, she enters her final interview which turns into a bizarre challenge of lie detection. Jyothi Kalyan Sura: While great science fiction films have always been my inspiration, this particular film was inspired by our real-world progress in Science, specifically the heights we have attained in Artificial Intelligence. I wanted to portray plausible science tackling real problems, and for an artist, depression is as real as it gets. So, I would say this film was largely inspired by humanity's progress in AI and my desire to use this tool to fight psychological disorders like depression. Kalyan: There were quite a few such instances - right from casting to the final sound mix, but the biggest scare came 5 weeks from our finish date when we still had 65 Visual Effects shots to finish besides the sound design and color session. For context, every shot with a phone or a monitor was a VFX shot, which was 95% of our film. Though I briefly considered pushing the finish date, I chose to put my faith in myself and my team. And as they say - fortune favors the bold - our amazing team was helped by some unexpected but welcome scheduling coincidences and we managed to push the film out in time. Kalyan: This one's a big list. If it takes a village to make a film, it takes an army to make a short film, especially one with a shoestring budget. My heartfelt thanks go to my team who are also my best friends - Jia (Vfx Supervisor), Enrico (Director of Photography and colorist), Nick and Don (Producers), Raashi (Score), Rommel (Asst. Director), Dag (Editor), Jo and Eric (Sound) and Katie (Production Design). Also, my family and friends who believe in my dreams and help me at every step. Last but not least, my mentor Mike Fink who always inspires me. Kalyan: Though I possess no significant talent for music, I grew to respect its power not just in films but also in various societies, cultures and in life. Raashi, my composer, and I decided very early on that we would integrate mellow themes with techno sounds, including sound effects for our AI character. This immensely helped the tone of the film. As for food, it is the first love of my life, so it goes without saying that food plays a vital role in my life and work. 5. T&T: What does it mean to you to screen your film at the 11th Annual Philadelphia Asian American Film Festival? Kalyan: It was a pleasant surprise when I received the notification email from PAAFF. Knowing how competitive and grueling film festival selections are and to be selected in a prestigious festival like PAAFF gives me immense joy and encouragement. I look forward to meeting the amazing pool of talent that will be present at the festival and also intend to get to know the people behind this wonderful festival. Mark Bochsler: Inspired by the determination of Cambodians and the grassroots movement to save their threatened heritage, we set out to make this documentary to capture a unique moment in Cambodian history -- a new cultural renaissance. A couple of years into documenting the story of Grandmaster San Kim Sean’s journey, unexpected events happened between the film’s characters, putting their Bokator revival mission at risk. Exploration of this allowed for deeper themes to emerge in the film, giving the film greater scope and purpose. Mark: In the beginning of our filming, I had my achilles tendon nearly lacerated, and was on crutches for nearly 4 weeks. Despite suffering infection and needing an IV drip every morning before shooting, I persevered. What kept us going was the determination of our characters themselves. Nothing would stop their goal of awakening Bokator or “surviving” as the protagonist calls it. Mark: So many amazing contributors to this project over the last 8 years. Creative collaborators who joined our team because of a belief in the film’s social value and potential for success. Please see credits in EPK section of film. Mark: With the film we wanted to promote Cambodian culture and uniqueness overall. 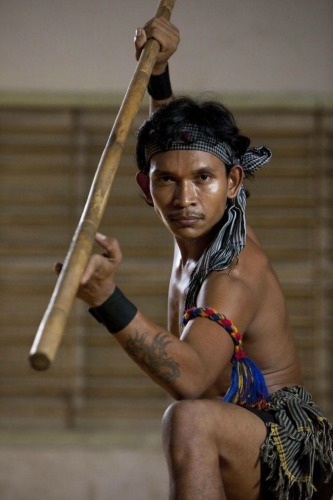 Hence we have included many nuances of Cambodian daily lives, which even if you travel there, you may not experience. Same with Music, which is a crucial aspect for the Director Mark Bochsler in general and in his films. Cambodia Space Project, a mix of traditional Khmer and western music. Unfortunately and quite devastating for the Khmer artis community, the lead singer Chanty passed just after the world premiere in PP due to a TukTuk accident. Khmer food: mouthwatering… definitely worth to be mentioned (Fish Amok or Beef Lok Lok one of my favorites), but it’s not really in the film. Mark: We are honored to be chosen to be among so many strong Asian Films, especially in Phili which celebrates its great diversity through cultural events like this. Also, it’s important that Cambodia gain stronger representation at “Asian” focused events given that not many know about its rich cultural heritage, which is often overshadowed by its neighbours. 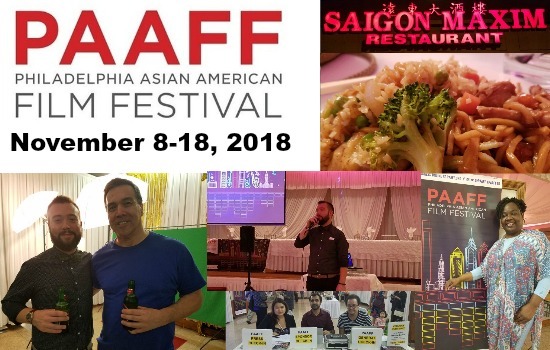 Original post: I attended the preview party for The 2018 11th Annual Philadelphia Asian American Film Festival, presented by Comcast and held at Saigon Maxim Restaurant in South Philly. This year's festival will run November 8-18, 2018 and feature over 80 films, the festival will include intimate discussions with filmmakers; celebrity chef catering;musical concerts; live theater performances by local Asian American and Pacific Islander (AAPI) artists; and more! TRADITIONAL & HIP HOP - Friday 11/9 at Lightbox Film Center In this showcase we will be exploring the connections between traditional and contemporary, showing how the lineage of musical practice within multiple generations of diasporic communities has helped create innovative approaches to the wholly American genre of hip hop. FOLK & INDIE - Saturday 11/10 at Lightbox Film Center The lineup includes Americana story songs to Filipino folk traditions, and an American-born Korean making music in return diaspora. Each of these acts deal with questions of authenticity, ancestral memory, and preserving the legacies of those who came before. The Opening Night Film (Thursday, Nov. 8th 7PM) is the East Coast Premiere of IN THE LIFE OF MUSIC which tells the story of how one song made famous by Sinn Sisamouth (the King of Khmer Music) plays a role in the lives of three different generations. Told in three chapters during three different decades, this touching drama depicts the lives of people whose world was inevitably transformed by the emergence of the Khmer Rouge Regime. Director Caylee So and other members of the cast & crew are expected in attendance for a Q&A, followed by a reception catered by a local Cambodian American chef. Speaking of which, music and film do go hand and hand, but as this is Tinsel & Tine, it's food and film we celebrate! Mark your Calendars for FILIPINO FOOD SUNDAY Nov. 11th at Reading Terminal Market FREE screening of Discovery Asia documentary series PRISON FOOD, several market vendors will be adding limited quantities of Filipino dishes to their menus for one-day-only as part of our Filipino Food Sunday event. Vendors confirmed to date include Sang Kee (Seafood Palabok) and Flying Monkey Bakery (Ube Cupcakes). 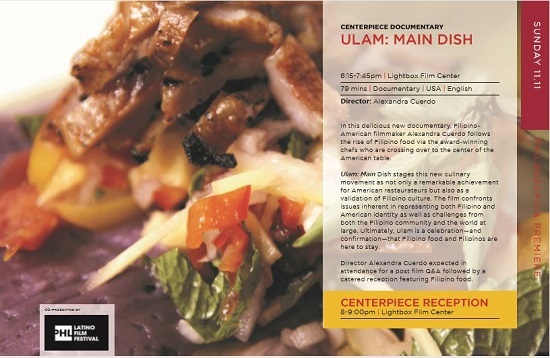 Ulam: Main Dish stages this new culinary movement as not only a remarkable achievement for American restaurateurs but also as a validation of Filipino culture. The film confronts issues inherent in representing both Filipino and American identity as well as challenges from both the Filipino community and the world at large. Ultimately, Ulam is a celebration—and confirmation—that Filipino food and Filipinos are here to stay. Director Alexandra Cuerdo expected in attendance for a post film Q&A followed by a catered reception featuring Filipino food.